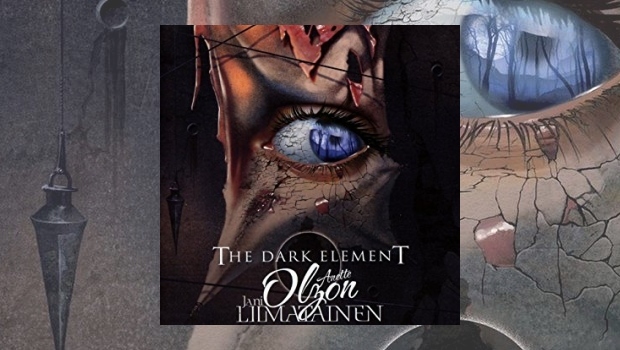 When I first learned Anette Olzon (former vocalist for Nightwish) and Jani Liimatainen (founding member and guitarist for Sonata Arctica) were collaborating on a project called The Dark Element, I jumped at the chance to review it. Olzon is one of my favorite vocalists and Sonata Arctica is a band I recently discovered and have enjoyed, so I was expecting something wonderfully epic from this release. What I got wasn’t what I expected, but the more I listened, the more my disappointment faded. Most of the songs follow the same basic pattern. They all start off sounding like they are going to be hard, metal tracks thanks to Liimatainen’s heavy riffs accompanied by synth strings, but the guitars soon recede into the background under Olzon’s vocals, which are supported largely by synth pads. A guitar solo leads into the final push to the end of the song. That isn’t to say the songs all sound alike. Nothing could be further from the truth, as each song has its own character. There are a few songs I want to highlight. The ballad Someone You Used To Know is one of the highest highlights of the album. Sonically, the song focuses mainly on Olzon’s voice, which expresses the desperation of the lyric perfectly, and acoustic timbres. Heaven Of Your Heart sounds like the main love ballad from a Broadway show. Dead To Me is probably the closest thing to symphonic metal on the album with its use of the synth strings to reinforce the vocal line throughout and a greater interaction between the synth, guitars, and vocals. The Ghost And The Reaper is a close second. I particularly like the cello interlude that interrupts the build up to the final choruses. I Cannot Raise the Dead is much more electronica-influenced than the other songs on this album. Aside from the solo, the guitars are largely absent from this track except to provide some power to the chorus. It is otherwise dominated by synth sounds. The album closer, Only One Who Knows Me was probably the song that took me the longest to get into. At first, it sounded like it is completely out of place, and I’m not a fan of the ’80s-style guitar solo fade-out ending. The more I listened to it, the more it seemed like it really fit as the closer. It is essentially a thank you to the person or people in life whose praise and admiration will still matter when celebrity fades and everything is said and done. I’m still not a big fan of the musical setting of the song, but it feels right on the album. Living up to expectations is the biggest challenge for this album. Since the band was marketed on the reputation of the members’ former bands, I expected a product that would sound similar to those bands. Also, with a name like The Dark Element (and the accompanying cover art), I expected the music to have a darker, perhaps more Gothic sound with down-tuned guitars and darker lyrics. Instead what we get is bright music with lyrics mainly about love and love lost. Overall, the album is more modern rock than symphonic metal, more like ABBA-meets-Evanescence or a synth-laden Halestorm than either Nightwish or Sonata Arctica. Once I got past my expectations, however, I really enjoyed this album. The songs are catchy and easy to sing along to. The overall musical textures are pleasing, and Olzon’s voice is as fine as ever. One minor, picky issue is that the Liimatainen gives some of his lyrics a bit of an edge through the occasional use of slangy grammar, like “don’t need no…” that commonly appears in rock lyrics. Olzon’s voice, however, is so clean and her diction so clear that it comes across more like your grandma reading Snoop Dogg lyrics than the gritty feel he was going for. Like I said, a minor, picky thing. Overall, this is an enjoyable album to just put on in the background or in your car. It is a thoroughly commercial album. There is nothing remotely “progressive” about it, unless you are desperate to make it fit and you want to hang your hat on the occasional hemiola in the vocal line, so if you are looking for something complex that requires intense listening to grasp all the nuances, you will need to look somewhere else.